A recent study conducted in the waters of Glover's Reef Marine Reserve in Belize by the Wildlife Conservation Society and its partners has revealed good news for spiny lobsters: the abundance of these commercially valuable crustaceans should support local fisheries into the future, an indication that no-take areas and other regulations are protecting the nation's marine resources. While the authors maintain that the current level of fishing is at a reasonable target level, they also note that many of the lobsters caught are on the small side. They recommend that increasing the size limit would make the fishery more sustainable. The study titled "Bayesian depletion model estimates of spiny lobster abundance at two marine protected areas in Belize with or without in-season recruitment" appears in the ICES Journal of Marine Science. The authors include: Elizabeth Babcock of the University of Miami; Robin Coleman, Janet Gibson, and Julio Maaz of the Wildlife Conservation Society; James Foley of the Toledo Institute of Development and Environment; and Mauro Gongora of the Belize Fisheries Department. "Overall, the fishery seems to be in good shape and the no-take areas seem to be protecting the species from overfishing," said Janet Gibson, Director of WCS's Belize Program. "One regulatory change that would strengthen protection for the spiny lobster population would be to increase the size limit of lobsters taken, a small adjustment that could ensure a future for the species and the fishery." This recommendation is also in keeping with that of the Central American Fisheries and Aquaculture Organization (OSPESCA). In order to produce an accurate abundance estimate of the lobster population in the waters of Belize, the research team applied a method known as a Bayesian depletion model to the catch-per-unit-effort spiny lobster logbook data to estimate the abundance of lobsters on the atoll. As part of a pilot program for rights-based, or managed access, fisheries management at the Glover's Reef Marine Reserve, Belize fishers are required to keep logbooks of their catch and effort. The results revealed the total population available to the fishery to be about 66,000 to 79,000 lobsters, with some of these lobsters being recruited to the fishery during the course of the 8-month lobster fishing season. A source of some of this recruitment is likely the no-take or conservation zone, which represents about one-fifth the reserve area. The results also showed that about 70 percent of these lobsters are caught annually. This study has important implications for the managed access program, as the recommended sustainable level of catch for the area will inform the basis of a lobster catch quota for the Glover's Reef Marine Reserve. "Essential to modern fisheries management are estimates of how many fish there are in the sea. In the Caribbean, abundance studies of commercially valuable species such as lobster provide a critical scientific foundation for management decisions," said Dr. Caleb McClennen, Executive Director of WCS's Marine Program. 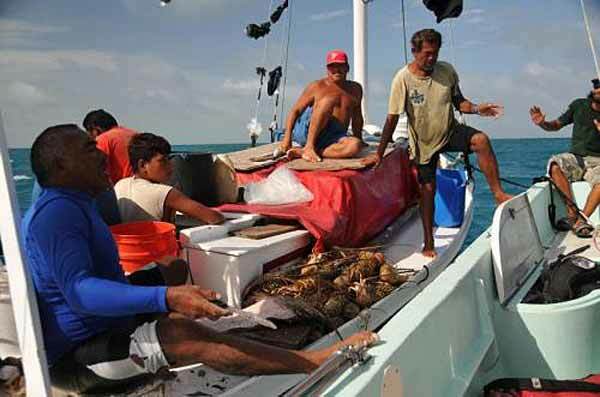 "With a few science-informed modifications, the spiny lobster fisheries of Glover's Reef, and the rest of Belize, will continue to support local communities in a sustainable fashion while protecting critical marine biodiversity."